Web company India.com - Providing customized web designing for the customers around the world. 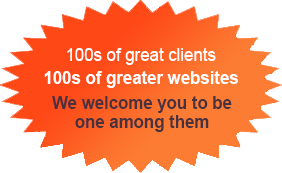 We are the answer to your query for qualified, reliable and credible web professionals to do your website. We are not blindly boasting our quality. We want you to assess the quality through the projects we have completed. We have two physical locations at the moment. One is in India where our development centre located (Calicut, Kerala, India +91494 2611598) and another in Middle East (Sharjah, UAE +9716 7467296). Soon we will have more locations as we are planning cover more places in Middle East and later to Europe and America. We have in our creative team the most talented, spirited and award winning professionals, ever ready to give our customers innovative ideas. Our designers know how to integrate their creativity to give productive results to your needs. We use the most up to date software and technology in creating your website.